Art conservators unveiled this week a recently cleaned and re-discovered portrait of the last Tsar of Russia, after it was cleaned of over-paint that obliterated the portrait on purpose. 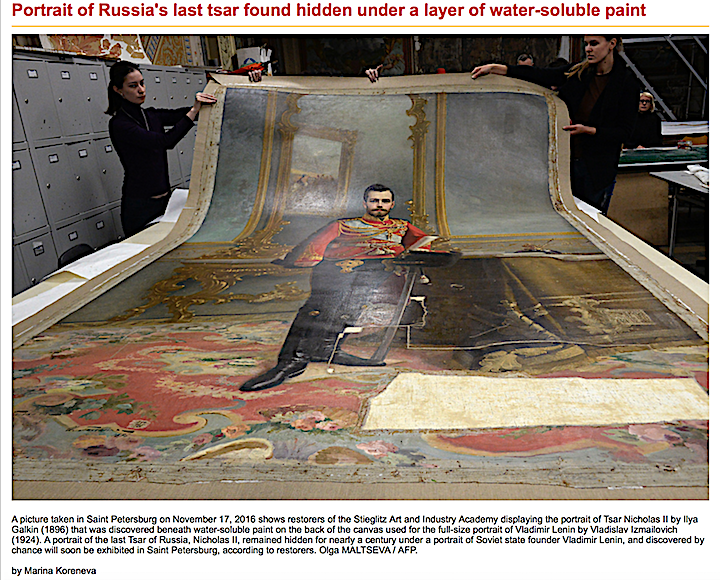 The portrait of Nicholas II took 3 years to un-cover from the repainting removal which may have been applied on purpose to save, preserve it in the hopes that it would be eventually found. “The ceremonial portrait painted by Ilya Galkin in 1896 was hidden for almost 90 years on the back of another portrait — depicting Lenin,” the painting rconservator, Potseluyeva told AFP. A portrait of Lenin was painted over the royal portrait by another artist, Vladislav Izmailovich, in 1924, Potseluyeva said. The giant portrait measuring 13 by 10 feet has hung in the assembly hall of a school in the historic centre of Saint Petersburg. The painting was damaged in the 1970s and it was only because of the restoration of this damage in 2013, which lead to the discovery of the hidden portrait. Obviously, unexpectedly finding such details underneith the portrait that was visible was very surprising adding that the first detail they discovered was the ornate carpet on which the tsar was standing. 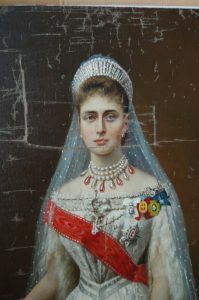 The artist’s motive for hiding the tsar’s portrait may never be known and experts said that he ran a risk by doing so. “By keeping the tsar’s portrait, Vladislav Izmailovich risked a lot at that time,” said the acting head of the Shtiglits Academy, Vasily Kichedzhi. The Bolsheviks pulled down statues and removed the tsars’ emblem from buildings after taking power. Today, given the politics with surrounding countries, such political pressures where art “takes the hit” are still a worry. This painting of Russian royalty was slashed with bayonets but eventually rolled up then smuggled out of Russia. This entry was posted in Painting on canvas and tagged cleaning a painting. Bookmark the permalink.